I deleted this and then reposted it so I might have accidently deleted a comment or two. I'm sorry. I need to make up my mind better before I post. Thank you for stopping by. You are all the nicest people. Excellent view, great landscape Marilyn. wow - this is wonderful, we occassionally see deer but never 4 at once! I did the same thing two days ago! Might even have been your comment that got deleted, actually! Awww, this is so serene. Love it! This is a really pretty scene! Great capture! Beautiful and placid scene. Lovely. Oh that just looks so idyllic! Well captured! I have not seen the deer that visit my yard in some time now...though sometimes I just miss seeing them for months at a time and then they return...or at least return when I am looking. Lovely scene...how nice to have deer visit. 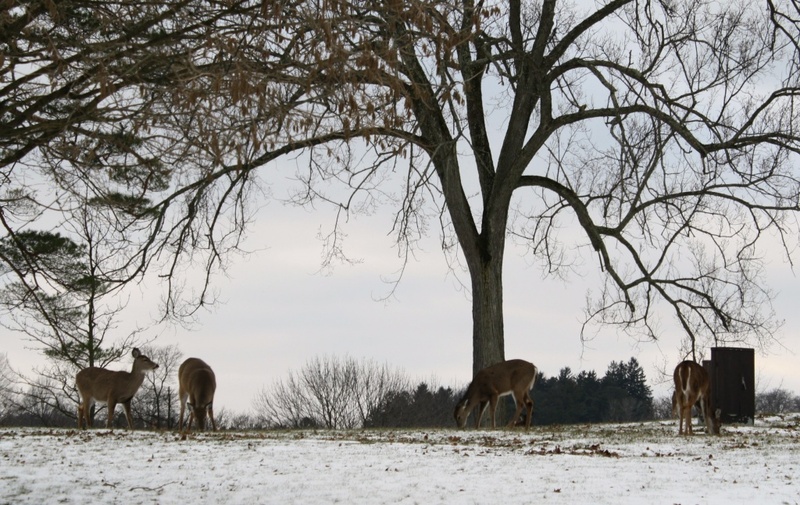 Such a serene peaceful and beautiful scene...the deer just complete the setting! Cool shot. We have deer around here. But we only rarely see them. In an urban environment they are very shy indeed. Nice shot with the snow too. nicely composed and shot! Lucky you! I love it. Of course I love nature photos so much so it is wonderful to see others post beautiful nature photos. I am envious as we passed by a cow that was at a fence near the road yesterday and my husband would not stop. Maybe next time. Love living with country surrounding us so closely. No deer though. Very nice capture..Doesn't look like they are bothered at all by the cold! Wonderful shot Marilyn. I love watching the deer and love to see shots like this. I am glad you posted, because this is beautiful!